Very cozy and comfortable studio which is recently renovated. The apartment is located on the first floor and can be reached through a very wide monumental staircase (1890). This wide staircase is the only thing you will be sharing with us. There is a comfortable and big queen sized bed and modern bathroom with a great shower. There are a lot of restaurants, cafes and shops in the surrounding area, so you will never get bored. The studio is also close to a lot of tourist attractions. 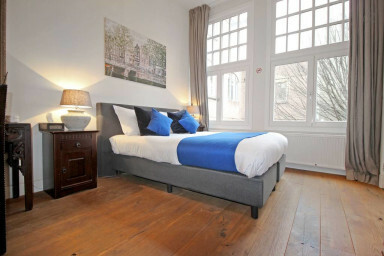 I am sure you will have a great time in this studio during your stay in beautiful Amsterdam! You have access to the whole studio including a kitchenette and a spacious bathroom. You do not have to share this place or any of its facilities with others. The owners live in the same building. We hand you the keys and show you around in the studio and -if you like- in Amsterdam. After that you can always reach out to us if you need any assistance. Do not hesitate to knock our door across the hallway for a chat or a few tips for sight-seeing or good restaurants. Oud-West is loaded with lovely fashion and homedesign boutiques, bakeries, coffee shops (both for actual coffee and the other ones) and trendy bars & restaurants. Food, film, fashion, crafts, retail and architecture converge at De Hallen: this cultural centre in a converted industrial building in Amsterdam’s most trendy part. Go for a stroll or for a run in the famous Vondelpark or buy your fresh treats at the Ten Kate Markt, the local food market next to De Hallen. Tram 1, 7 and 17 go just around the corner. The other way around, trams 1 and 17 bring you to Amsterdam Lelylaan train station, which is only 1 stop away from Amsterdam Schiphol Airport (7 minutes train ride). The total journey from the studio to the airport check-in desks (walk + tram + train + walk) is around 30 minutes. Going to the airport by car takes about 20 minutes. Uber taxi to/from Schiphol Airport will usually cost around EUR 28 whereas regular taxi’s are around EUR 33. Beware of scams; always ensure you engage a legit cab driver (we therefore very much recommend using Uber). If you fly from Schiphol in the morning, do let us know. My husband works at Schiphol and he’s happy to give you a lift. Normal check-in is before 9pm and normal check-out is 11am latest. Late check-in is possible, but will costs an additional EUR 20. For check-ins after midnight EUR 50 will be charged. For other check-in and check-out times please contact us. Are you interested in a late check out? Please check the availability 2 days before your check out date. If the apartment is available we offer a late check out at 14:00 for an additional charge of 20 euro. Our experience was great. Good communication and means of contact made me feel confident in my stay.